Transparency Market Research (TMR) has recently published a market study on the global automotive crankshaft market, estimating the market to expand at a CAGR of 2.10% during the period from 2015 to 2021 and reach a market value of US$3 bn by the end of the forecast period.The research report, titled “Automotive Crankshaft Market - Global Industry Analysis, Size, Share, Growth, Trends and Forecast 2015 - 2021”, states that worldwide automotive crankshaft market stood at US$2.5 bn in 2014. 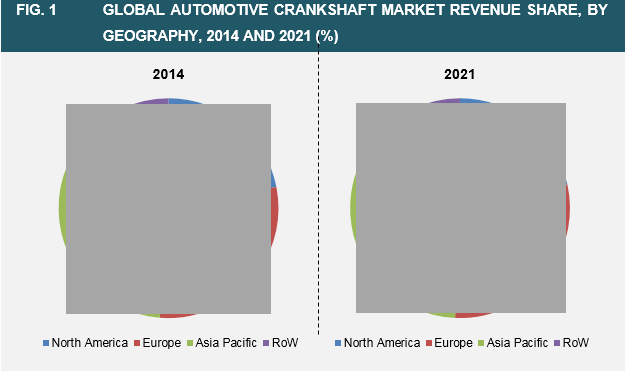 The expansion of the worldwide automotive crankshaft market depends on the dynamics of the global automotive industry. Currently, the automotive industry is reporting an immense growth in the global arena, which is subsequently driving the global automotive crankshaft market. The huge capital required for R&D activities for the further advancement of crankshaft is, however, creating a severe challenge for the market, as per the report.The report analyzes the global automotive crankshaft market on the basis of the types of crankshafts, materials utilized, and the types of vehicles. Based on types, the global automotive crankshaft market is classified into the markets for flat plane crankshaft and cross plane crankshaft. The flat plane crankshaft market is leading the overall market at present. Forged steel and cast iron are the primary materials utilized to make automotive crankshaft.The markets for light commercial vehicles, heavy commercial vehicle, sports utility vehicles (SUV), multi utility vehicles (MUV), passenger vehicles, and other vehicles are the major segments of the worldwide automotive crankshaft market on the basis of vehicle types. Among these, the market for passenger vehicles is likely to register the highest growth over the forecast period. The increasing disposable income among middle-class consumers has led to increasing preference for passenger vehicles, thereby fuelling the demand for automotive crankshaft to a great extent. In addition to this, the global market for automotive crankshaft is projected to experience a significant demand during the forecast period, owing to the escalating demand for diesel cars and heavy commercial vehicles across the globe, the report states. North America, Asia Pacific, Europe, and the Rest of the World are the primary regional markets for automotive crankshaft. According to the report, the automotive crankshaft market in Europe led the global market in 2014 and was closely followed by the market in North America. High disposable income has raised the purchasing power of consumer in these regions, which has triggered the demand for automobiles and eventually, the demand for automotive crankshaft significantly. Analysts expect these regional markets to exhibit a stable growth throughout the forecast period. It is, however, the automotive crankshaft market in Asia Pacific, which is likely to witness the highest growth in the coming years owing to the rapid rise in the automotive industry fueled by the increased affluence of consumers in this region.The growth in vehicle production in Rest of the World is also projected to support the automotive crankshaft market during the forecast period, notes the study.Bharat Forge, Amtek Auto, ThyssenKrupp, Mahindra CIE Automotive, NSI Crankshaft, Cigueñales Sanz SL, Bryant Racing, Maschinenfabrik ALFING KESSLER, Arrow Precision, and Tianrun Crankshaft are the key players functioning is the global automotive crankshaft market, states the market report.